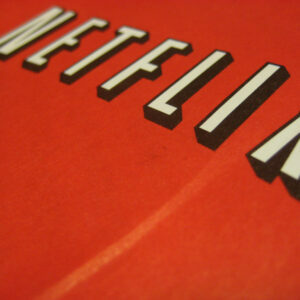 *We love bringing products to you that we think you’ll love.  We are grateful to The Container Store for sponsoring this post and providing these holiday storage solution products to us. Opinions are our own. I’ve been called a lot of things . . . Organized has never been one of them. 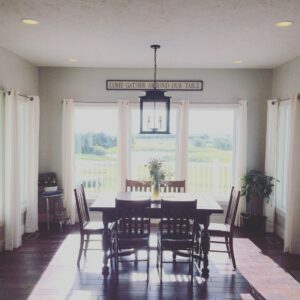 It never used to bother me, but now that I’m a mom, I realize just how necessary organization skills are for survival—and how my lack of them is part of the reason I struggle to keep my head above water most days. 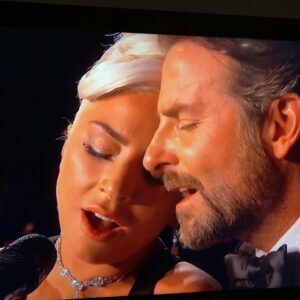 My nonexistent order for our family’s laundry means high stress levels in the morning as we search for matching socks two minutes before the bus arrives. My missing filing system for household papers results in piles of mail, artwork, and school newsletters piled on the “junk counter” with nowhere to go. 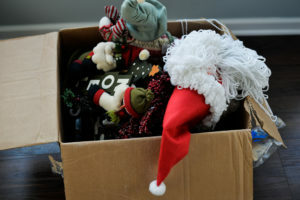 As I get ready for the holiday season, I recognize the lack of any purpose to my holiday decor storage results in a frustrating process of searching cardboard boxes for what I need—and finding burned-out strings of lights and broken sentimental ornaments that weren’t properly stored last year. I’m the type of person who could just cry thinking about how much I love watching our 4-year-old try to help his dad put up the outside lights. I love how meaningful it feels to pull out our array of precious holiday ornaments and talk about the people they make us think of. I adore the tradition of putting together our mini artificial tree with my daughter. But I’m also the type of person who needs help keeping the “stress” out of these moments to make room for the magic they bring. 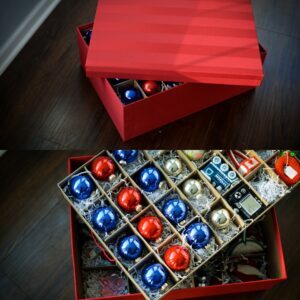 When The Container Store gave me an opportunity to revamp my holiday storage system, I jumped at the opportunity. 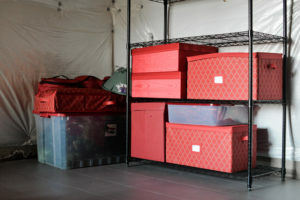 My lack of organizational skills can negatively impact the flow of our family’s day and dampen our holiday decorating experience—but The Container Store saves the experience by providing me with a plethora of storage and organization solutions for properly storing all of our household holiday staples. Wrapping supplies storage has always frustrated me. 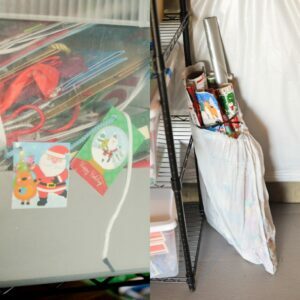 A tangled mess of wrapping paper in a bag takes up awkward space in storage, while the ends of the rolls get ripped and bent. Inevitably, other wrapping necessities like scissors, tape, bows, ribbon, and tags end up in another place—and I spend just as much time searching through bins for what I need as I do actually wrapping gifts. 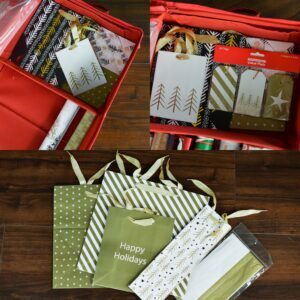 My favorite new solution is this Holiday Wrap and Tote Organizer that allows me to store my wrapping paper, bags, tags, scissors, tape, bows, ribbon, and anything else I need for wrapping the perfect gift. No more lugging awkward bags and searching for scissors—it stores in a compact, flat tote with a handle that makes it easy to transport and even easier to store. And I love that The Container Store also offers beautiful gift wrap sets! 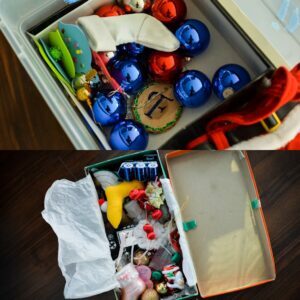 When my husband’s grandmother passed away, we inherited a box of her old Christmas ornaments. As someone who still has ornaments from my own childhood, having these family mementos is something I cherish. Each year, we laugh at the random assortment Grandma owned, we reminisce about the ones we coveted as children, and we love seeing the ornaments the kids have made for us in years past. 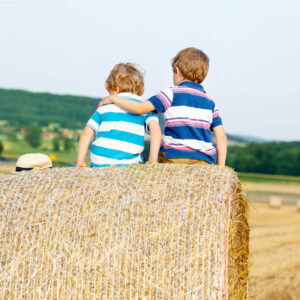 We have always stored these memories piled one on top of another, hooks jutting every which way in a tangled jumble. . . inside a shoebox. When I opened that box last year, I discovered a favorite ornament from my childhood had shattered, and I was devastated; I shouldn’t have been surprised considering the way I stored it. 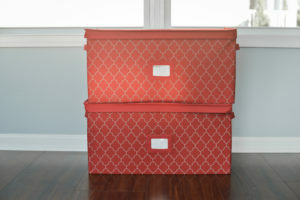 Our storage avenue certainly wasn’t indicative of the value we placed on the items inside—which is why I was so excited to move everything over to these Red Moire Archival Ornament Storage Boxes. 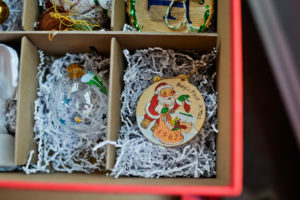 The boxes keep each and every ornament safe within its dividers and cushioning packing shred, and are sturdy enough to stack a few of them on a shelf when the holidays are over. 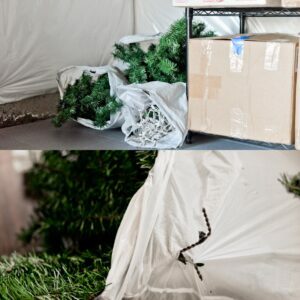 It all makes for better protected ornaments that will easily withstand their post-holiday hibernation in the storage room. I absolutely love the tradition of our family spending quality time together decorating our house and our tree—but nothing kills that seasonal mood faster than a box of tangled, broken lights. 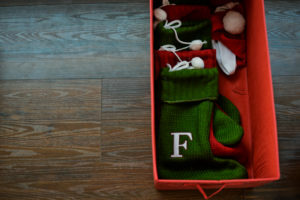 My husband gets frustrated untangling cords in the cold—or running yet again to the store to buy replacement strands—and before you know it, the holiday spirit is fading and the kids have lost interest in being involved at all. 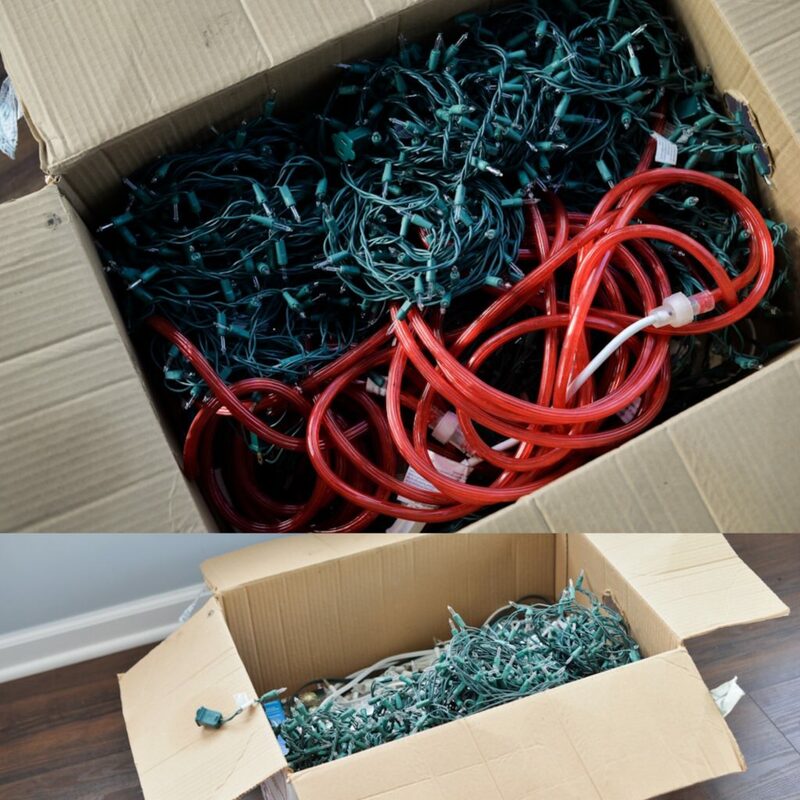 We’ve always just loosely rolled our lights and tossed them together in a box, knowing we’d just deal with the sorting and untangling the following year. 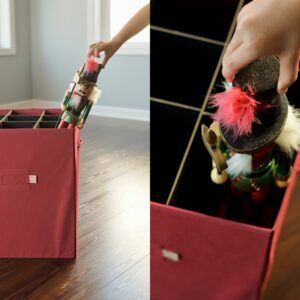 These TreeKeeper Install n’ Store Light & Garland Storage Boxes are just what our family needs to streamline the process. 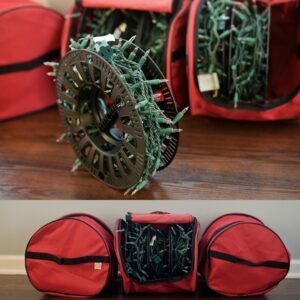 Each box holds three reels for lights or cords; when it’s time to hang the holiday lights, simply unravel the coils. 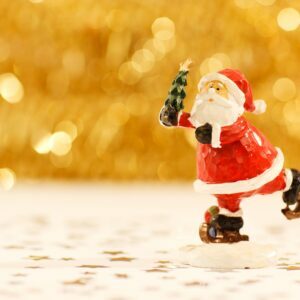 They wind back up just as easily when it’s time to put the decorations away, saving those unnecessary headaches for next year’s decorating memories. While I love the tradition of getting a real tree for Santa to stack presents under in the living room, I love the miniature artificial tree we use to add holiday spirit to another part of our house. For years I have stored the pieces of it in garbage bags, and every year I do battle with the wire ends sticking out of the plastic as I store them for the season. What’s more, those bags were bulky, awkward, and impossible to store anything else on top of when I shelved them for the season. 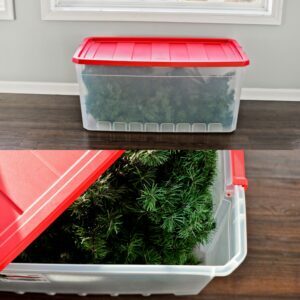 When I saw The Container Store offered this perfectly-sized Sterilite Tree Storage Box that neatly stores the parts of my tree, I jumped on the opportunity to make the change. It’s not only more neatly stored (and cured of those poking-out wires! )—I can now stack other items on top of it, which gives me additional storage space. There’s even enough room to store some of our small outdoor decorations, too. Like most people, I have an array of other holiday decorations in varying sizes that I used to stuff into random boxes. I love the idea of storing that decor in red totes to differentiate it from non-seasonal items, and The Container Store has the perfect solution. I used the Tall Collectible Storage Box for accessories like nutcrackers and candles—and the Holiday Storage Chests for items like stockings, wall decor, and kitchen counter items. After condensing all of my items, I felt like it not only achieved safer and neater storage—it opened up more shelving space than I had before. 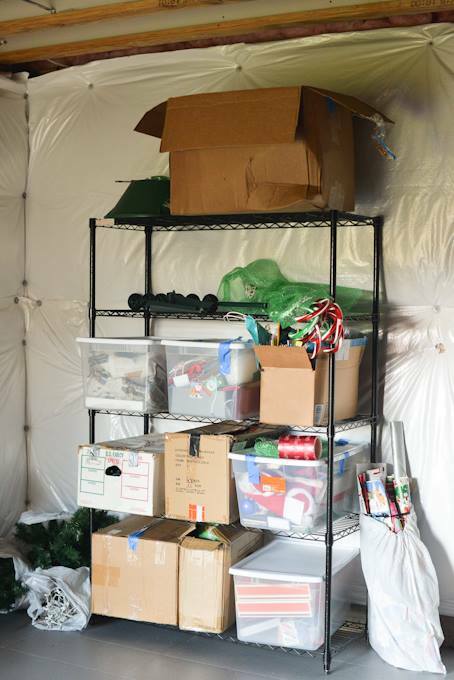 I love that my holiday decor is distinguishable now from other boxes in my storage area, and that I know my items are being stored in a way that shows how much the items inside of them mean to us. 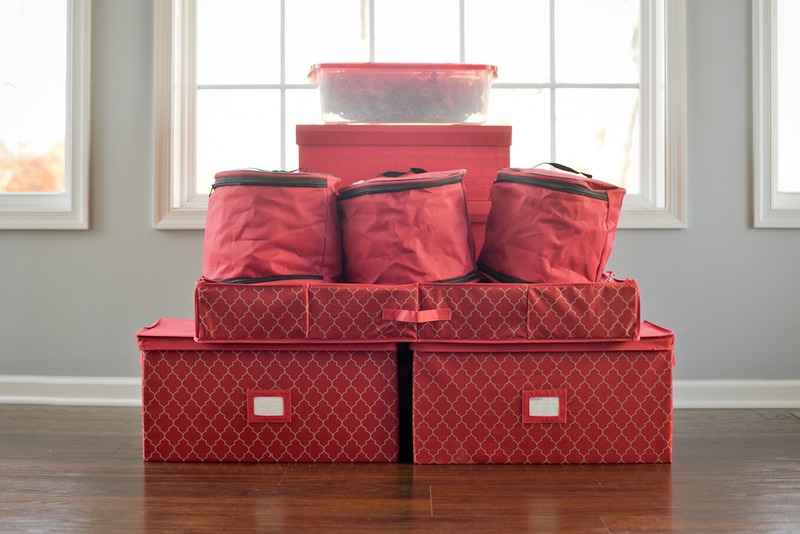 With all these organizational solutions in place, I’m confident that when the holidays roll around next year, decorating will be simpler and more enjoyable thanks to The Container Store. 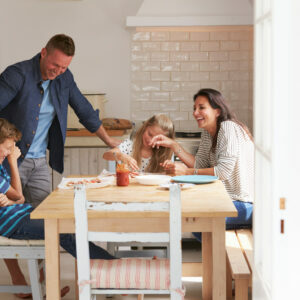 Our family will spend less time searching, untangling and hauling—and more time doing what the holidays are all about: making precious memories.